Dog boarding in our home is available for our dog clients who get along with cats and other dogs. No kennels, confinement or long, lonely stretches. Your dog becomes part of our family, walking with us twice a day and playing in our fenced, shady yard. All you need to bring is their food – we provide the comfy dog beds, filtered water, nylabones, and the loving companionship! No kennels, isolation, hard concrete floors, or loneliness. Your dog is guaranteed to come home happy and tired! 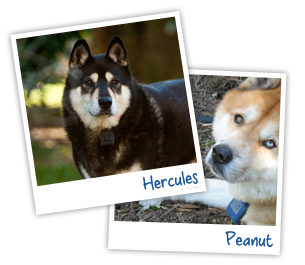 We have three dogs who are our canine host and hostesses – they will be sure to play, play, play as long as your dog wants to. If your dog is a nap-hound, that’s okay too. We will make sure they have the space and quiet time desired. We take two walks a day and play in our fenced, shaded yard in between. Activities vary between fetch, hide-n-seek, chase bubbles, splash in the hose and wading pool, just to name a few! Appropriate care is taken to group dogs harmoniously according to energy level and personality, although no aggressive dogs are accepted. Dogs are separated at their meal time. No table food is fed to them. Your dog’s food must be provided and will be refrigerated if needed. Your instructions regarding time, quantity, supplements and medications will be followed closely. If you want to bring a crate, bedding, and toys you may do so but it’s not necessary. We will crate a dog per your instructions (i.e. to continue training, when we leave the house or at night). Prices & Services Learn about what we can do for your pet. Questions Browse our FAQ for your answer. Facebook Share your pet photos and stories! Pet Partners is much more than a dog walking service — they help make our lives run smoothly. We have two large dogs, a toddler and busy jobs and Sherry and her team are always ready to provide an extra walk when needed. If you have dogs and a demanding schedule, you really need to add Sherry to your team! I have been using PetPartners for so long now that they are like family. Sherry has always been so professional, prompt, and caring of our dogs. We LOVE YOU GUYS! Woof! Woof! All content is copyright Pet Partners 2013. Photos of pets belong to their respective owners and are used with permission. No content or photos are to be used without express written consent.